There are plenty of things to do in Storm Lake, IA and attractions for just about anyone! You might be tempted to spend your days comfortably curled up in your room, but we encourage you to get out there and experience all this area has to offer. Buena Vista University (BVU) is just 2 miles away! If you’re a sports fan or have a child off at the college, there’s no shortage of events happening around the year. Catch a football game, visit the student center, see a performance art show or attend one of the many campus activities hosted. See what’s coming up on the BVU calendar! If you’re an angler, Storm Lake has plenty of fishing opportunities. Rent a boat and hit the water during good weather and you’re sure to catch something worth keeping! Or, fish from the boardwalk and reel in a prize—just make sure you have your camera handy! The lake is rife with catfish, crappies, carp, walleye, bass and yellow perch, among others. 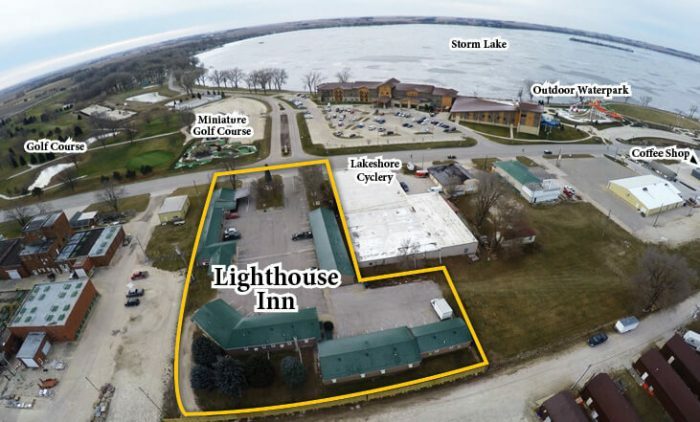 We get tons of people passing through town from Minnesota, Nebraska, Missouri, Illinois and Wisconsin who come to Storm Lake to enjoy King’s Pointe Resort. This waterpark is fun for the whole family and is sure to occupy your afternoons! When you’re done, walk back across the street to our inn, take a hot shower and kick back in relaxation. There are plenty of indoor and outdoor wedding destinations in Storm Lake. People host weddings across the street at the King’s Pointe Resort or out near the boardwalk, then conveniently lodge with us! We’ve got space for bridal showers and gift openings. Plus, there are plenty of other things to do in Storm Lake, IA to keep you busy while you’re in town for nuptials! Want to catch a band performance you won’t soon forget? The Storm Lake Municipal Band performs at the Sunrise Park Band Shell all throughout the summer, with a regular calendar of shows. Stop by and soak up the sounds in an environment that’s enjoyable and airy! Throughout the area there are a number of chainsaw sculptures. Take a walk and take in the works of local artist Jeff Klatt, who has been carving old stumps and felled trees into beautiful depictions for years. You can find a current list of sculptures and a route to see them all at the Storm Lake United office. There’s tons to see and do in Storm Lake! We invite you to come and experience our town for everything it has to offer—including the natural sights and sounds of our namesake lake. For more exciting activities, we’re happy to make recommendations and can point you in the direction of time well spent in the local area.